The scandal over the procession of pilgrims of the Ukrainian Orthodox Church (Moscow Patriarchate) to the Pochayiv Lavra is aggravating. 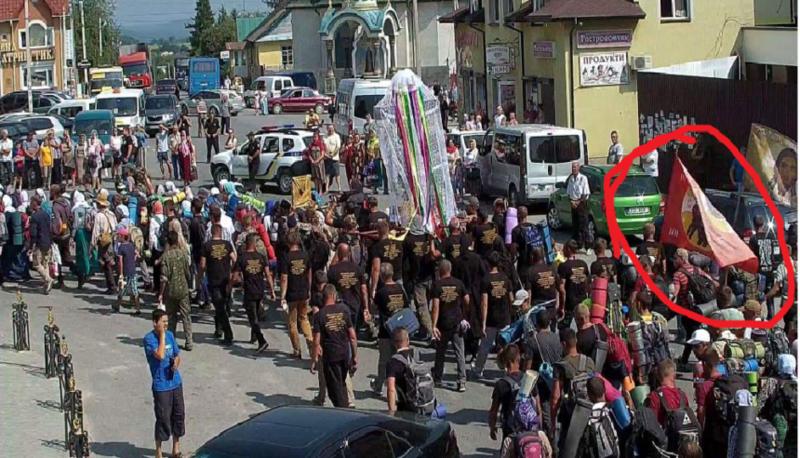 In addition to T-shirts with prints calling to get ready for the war, the crowd noticed the Orthodox flag under which the fighters of the so-called Donetsk People's Republic are fighting. Dmytro Poliukhovych wrote it on his Facebook page, Relihiyna Pravda reports. 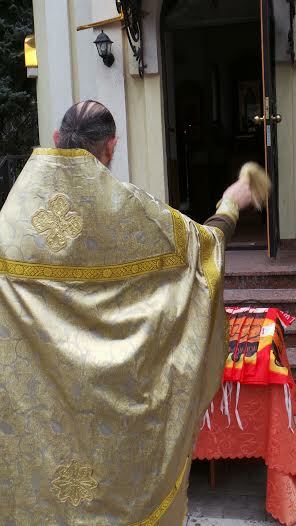 He posted a photo of the procession, where the flag depicting The Saviour Not Made by Hands can be seen. In 2014, it was blessed by terrorists in Donetsk as a symbol. Dmytro added a link to the page of Russian human rights activist Anna Kyslychenko in Live Journal. In 2014, Anna wrote that “Margaret Seidler, an employee of the Information Service of the People's Militia Headquarters of the DPR”, sent a small article. “It's joyful that our soldiers will fight under the banner of Jesus Christ! Little article about joyful event,” Margarita wrote. 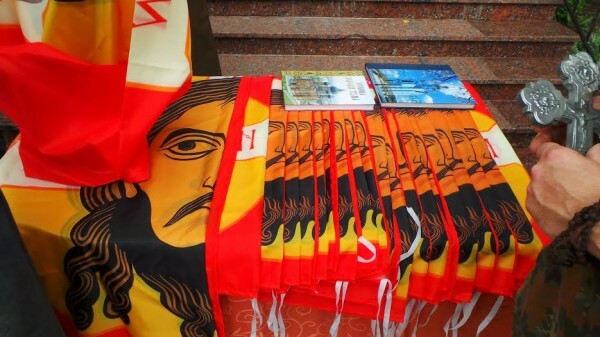 In particular, Anna's post said that in Donetsk the flag was consecrated with the image of the Savior Not-Made-by-Hands for the “Army of Novorossiia”. “The flag of the Savior of Not-Made-by-Hands is an ancient flag with which our glorious Orthodox ancestors fought and defended their homeland. They were not sorry to give their lives for the Faith, the Tsar and the Fatherland! With this flag they defeated the enemies – mainly the Tatars and the western invaders, the Poles and the Frenchmen, for example,” goes the statement. “Under this flag, the soldiers of St. Dimitri Donskoy went to the Kulikovo field and defeated numerous troops of Mamay. Under this flag, the Russian people performed peaceful and armed feats. Tsar Ivan IV (Grozny) in 1552 went to Kazan with flags with the face of Christ and freed him from the Tatars,” goes the text. “Here and now the western occupiers encroach on our lands, on our lives, on women and children. The long arm of the United States and the European Union acts through the Ukrainian fascists. And I believe, again, we will defeat our enemies with the flag of the Lord and our God Jesus Christ! It's joyful that our warriors will fight now under this flag. This, we can say, is the realization of the words of the Athos's Elder, Schema-Archimandrite Raphael (Berestov), “The militants are fighting for Christ and with Christ,” writes the author. 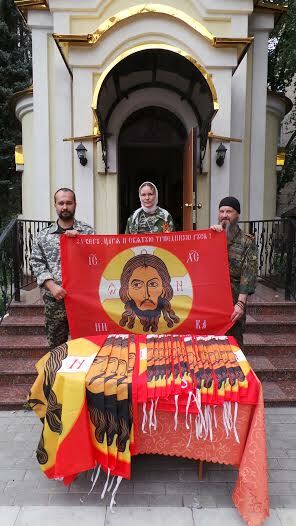 On July 19, the priest of the Ukrainian Orthodox Church-Moscow Patriarchate (UOC-MP) blessed a large number of these flags for the “Army of Novorossiia”. In the temple in the center of the city the fighters of the so-called “militia” have gathered. Igor Borisovich Ivanov, Head of the Political Department of the Army of Novorossiia, and Information and Policy Counsel to the Minister of Defense Igor Mikhailovich Druz were present. “Having blessed the banners, the priest blessed all the fighters to defeat the fascists, made a brief sermon in support of the soldiers. He finished his sermon with the following words, “Our cause is just! The day is ours, the enemy will be defeated!” the Russian human rights defender says. It is amazing how much rubbish can be written by that marionette from moscow, so called ¨Margarita¨ .... rubbish some as encroached land by USA and the EU thru Kyiv fascist .... It is a pitty that people without any education believe such nonsense. All for the benefit of a few crooks that are spoiling what is left of Donbass and its people ..